George Bates shared a screen shot with me on Twitter of a new location extension named "affiliate location extensions" in AdWords. It shows the "relationship type", the country and the available chains you can pick from. I am not 100% clear on how this works, but it seems like you can define if you are an affiliate and then select the chains Google has available. 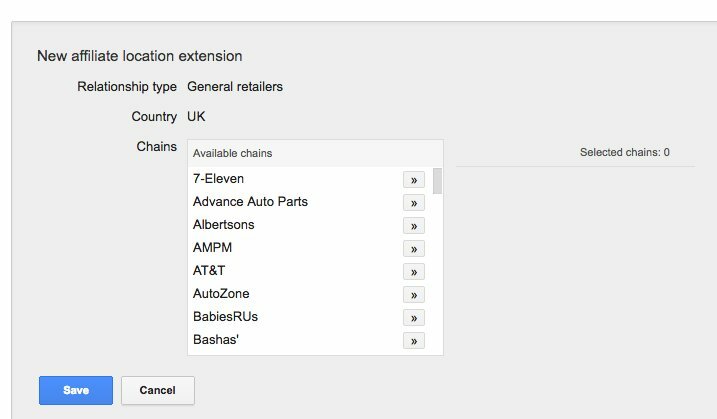 You can see chains such as 7-Eleven, AT&T, Babies R Us, AutoZone and many more popular retail chains. Again, I am not sure how this works exactly but I suspect we will learn more over time. Update: George added more details about this over here. Update 2: Google announced it 30+ hours later on Google+.